This article was originally printed in the July/August 2018 issue of HAKOL. On Monday, July 23, 12 students and I ran between the raindrops (and even had some sun) to harvest our first crop from our beautiful and bountiful JDS School Garden, which is also growing pumpkins, garlic and tomatoes! With help from Mr. Ron Sunshine we pinched (not cut or plucked) off the basil from our lush plants to give to Chelsea Karp, volunteer coordinator for Jewish Family Service. Seventeen families were scheduled for their monthly appointment at the Food Pantry the next day. 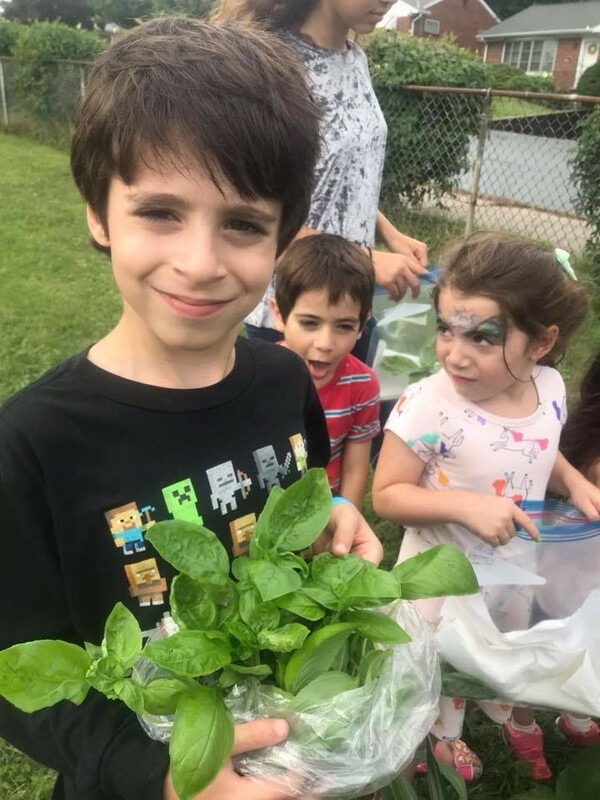 Partnering with JFS allowed us to share our bounty of delicious, fresh herbs with families in need. Morah Joanna Powers, Hebrew and Judaics director at the JDS, led us in a few prayers to mark our basil harvesting ceremony. Because this was the first harvest, we said the Shehechiyanu blessing that celebrates any new milestone in our year. We also smelled the sweet basil and said "boray eesvay b'samim," which means "Blessed are You, HaShem, Who creates fragrant herbage." Finally, we sang the first paragraph of birkat hamazon together, which reminds us that HaShem "gives food to all creatures [and] does good to all ...[so that] we never be in want of sustenance." Between the JDS and the JFS, we are doing our best to celebrate blessings and to help make our community a better place!